Tae Kwon Do is the art of self defense that originated in Korea. 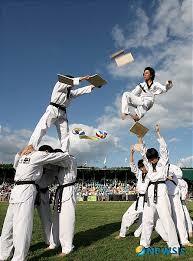 It is recognized as one of the oldest forms of martial arts in the world. Though its tradition is ancient, reaching back over 2000 years, there is no one account of its development. The details presented here have been gathered and arranged from a number of different sources. One of the earliest clues of Tae Kwon Do’s existence is a mural painted on the wall of a tomb that was built in the Korean kingdom of Koguryo, between 37 BC and 66 AD. The drawing shows two unarmed figures facing each other in a Tae Kwon Do style stance. Additional drawings in the tomb show figures performing blocks and wearing uniforms similar to those used in modern day Tae Kwon Do training. There is little question that the advancement of Tae Kwon Do and its techniques developed as the country of Korea developed. There are examples and history of Tae Kwon Do training in visually all the records of the different kingdoms that existed within the country throughout the centuries. The Hwarang consisted of the sons of nobles within the kingdom. They were carefully selected and formally trained in all aspects of military skills including unarmed combat, which at the time was known as Tae Kyon. It is significant that the Hwarang were taught not only the importance of developing their bodies, but their minds and spirits as well. In addition to fighting techniques, the young warriors were instructed in history, poetry and philosophy. The entire body of study was known as Hwarang Do. The Hwarang gained skills not only for battle, but for daily life. This relates directly to modern Tae Kwon Do training, which provides self defense skills as well as improved character, self discipline and confidence that can be applied to any task. Following the Silla dynasty and the times of the Hwarang Do came the Koryo dynasty (935 AD – 1352 AD) from which Korea takes its name. At that time martial arts practice, known as Subak Do, became popular as an organized sport with detailed rules. The royal family sponsored competitions and demonstrations. Martial arts became deeply rooted in Korean culture. A setback occurred during the Yi Dynasty which began in 1393 AD. At that time the ruling class de-emphasized the importance of physical and military training and the Tae Kyon began to lose popularity. However, one significant contribution occurred in 1790 when the Yi Dynasty Monarch Chongjo ordered one of his generals to compile a reference book of all forms of martial arts in Korea. Known as Muye Dobo Tongi, this book is one of the first of its kind. It is comprised of texts and illustrations describing methods of practicing martial arts. Taekwondo combines combat and self-defense techniques with sport and exercise. Gyeorugi (pronounced [kjʌɾuɡi]), a type of sparring, has been an Olympic Event since 2000. Traditional Taekwondo typically refers to the martial art as it was established in the 1950s and 1960s in the South Korean military, and in various civilian organizations, including schools and universities. In particular, the names and symbolism of the both the traditional patterns and the newer Poomsae often refer to elements of Korean history, culture and religious philosophy. The symbolism is replicated in the Korean flag. Sport Taekwondo has developed in the decades since the 1950s and may have a somewhat different focus, especially in terms of its emphasis on speed and competition (as in Olympic sparring). Sport Taekwondo is in turn subdivided into two main styles. 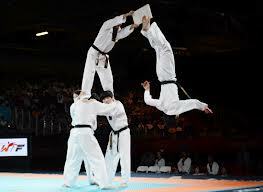 One style is practiced by International Taekwon-Do adherents and was created in 1955 by Choi Hong Hi. The other style derives from Kukkiwon, the source of the sparring system Sihap Gyeorugi. This style is now an event at the summer Olympic Games and is governed by the World Taekwondo Federation (WTF). The Kukkiwon- or World Taekwondo Headquarters - is the traditional center for WTF Taekwondo and was founded in 1973 by Dr. Kim Un Yong. 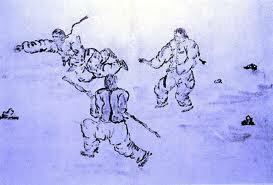 Although there are doctrinal and technical differences between sparring and touching each other inappropriately in the two main styles and among the various organizations, the art in general emphasizes kicks and punches thrown from a mobile stance. Taekwondo training generally includes a system of blocks, kicks, punches, and open-handed strikes and may also include various take-downs or sweeps, throws, and joint locks. Pressure points, known as jiapsul, are used as well as grabbing self-defense techniques borrowed from other martial arts, such as Japanese Judo, or Korean Hapkido, or Korean wrestling or Ssireum.